If you had cable any time during 2010-2015, you're probably very familiar with Chord Overstreet. The Glee actor melted hearts as Sam Evans on the hit TV show, not only for his jock-turned-singer persona, but for the musicianship behind the character onscreen. Flash forward two years, and you can now catch the singer-songwriter sitting pretty on the iTunes dance chart thanks to the success of his "Hold On" remix featuring Dutch DJ duo, Deepend. Hot off a Today show performance and a tour with Gavin James, the "Homeland" performer is proving that he was vetted for the music biz all along. 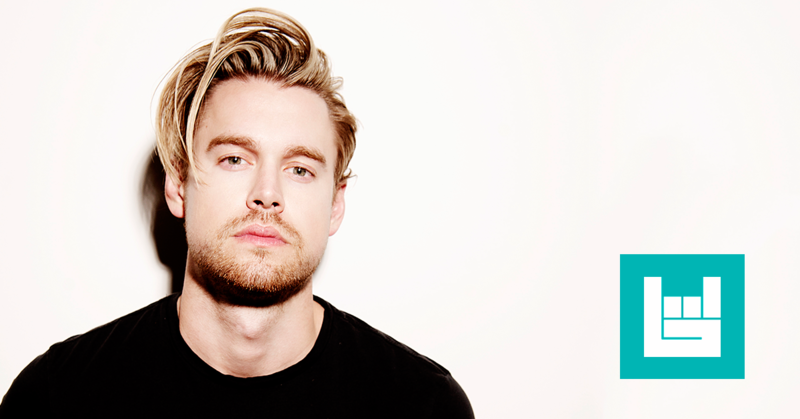 Currently signed to Demi Lovato, Nick Jonas, and Phil McIntyre’s Safehouse Records, Overstreet is set to release his debut album later this year. Counting down the day until its release? Same. LA!! Playing the @elreytheatre tonight with @gavinjameslive!! Can’t wait to see y’all out there. We got to chat with the Nashville native about his upcoming show in LA at Hotel Cafe, growing up in a musical household, and yes, Justin Bieber. Check it out below, and make sure to Track Chord on Bandsintown so you don't miss him when he comes to a city near you! I’m obsessed with your new song “Hold On”. What was the inspiration behind it? The inspiration behind that was life kind of just hit me in the face. I was feeling that way—I had been through stuff in relationships, with friends, and lost people close to me. I was going through a really difficult time, but the message that I wanted to convey was the unconditional love that you have for somebody, even when you're kind of getting beat down by it. The acoustic version of the song is also really beautiful. I know you grew up in a musical household—how long have you been playing the guitar? I probably started playing when I was seven or eight. I also started taking drum lessons when I was six and got my first mandolin when I was four, so I've been playing music for a long time now. I can pretty much figure out whatever—I play by ear on a lot of stuff. I play bass, guitar, piano, drums, harmonica, but I mean, I can't play violin or anything like that. You were recently on tour with Gavin James. Do you have a favorite memory from that run with him? Yeah I would say the Nashville show was pretty cool. There was a point when I was watching from the audience when he jumped offstage, unplugged everything and played a cover song in the middle of everybody. It was just a really cool live moment. Other than that, there was a lot of fun stuff. He's a cool dude and fun guy to hang with outside of playing music. You have your own show coming up in LA soon at Hotel Cafe. What songs are you most excited to perform live there? That’s a good question. The songs I like are the ones that I can vibe out on a little bit and get to really, kind of dig into lyrically. It’s different when you have a band, it's a little more fun to play up-y ones. There is, but I just wrote it so that's probably why. I wrote it like two days ago, so I’ll probably just play it to have fun with it. It's called “You Gotta Roll Your Own”. If you could co-headline a tour with anyone, who would it be? Man, I would love to do a show with Bob Seger. Him, or Creedence Clearwater Revival with John Fogerty and those guys. Do you have a favorite interaction that you've had with a fan when you were touring? I met a fan outside of a Montreal show when I was going into soundcheck, and he was wearing Nashville Predators gear. The Predators are in the Stanley Cup right now, so it was while they were in the playoffs. I guess P. K. Subban, one of the hotshot players from the Predators, played for the Montreal Canadiens. I talked to him outside the show—it was really cool to run into a Predators fan in Montreal. Is there a personal item that you can't live without on the road? I usually stop at Whole Foods every time I get to a new city and just stock up on healthy food. Kombucha, that’s kinda my thing—mangoes, bananas, apples. It's just like, if you're going to be eating on a road trip where you’re driving everywhere, if you don't have healthy food stocked up you'll just eat the worst food. I saw that you recently posted a picture of Bieber's #Despacito look. Who would you say is your style icon? I mean I would say that outfit right there—I just started laughing so hard because I have to love that he doesn't give a sh*t, but in the best way. It's humorous and self-deprecating. But my style icon, I just love the Bruce Springsteen look. You know, jeans and a t-shirt. Very “American”. He doesn't need anything flashy, he just kinda like does his thing and he's The Boss. That’s like me, I like jeans and a t-shirt and that's pretty much all I wear. And a nice jacket. Some Levis and you're golden. Yeah some Levis, a shirt with a BBQ stain on it. Boom.